I'm brand new with this software so beware of lame questions. Looking at the short tutorial on using the File utilites dialog, I'm trying to see a way to select files that are above a specific size. I may be missing something that will do that in the list... The dialog is scrunched into such a small space that the list only appears 3 lines at a time and scrolling happens so quickly... I can't really tell if I'm seeing them all. Maybe if I describe what I want to do, someone will know how it is to be done. I want to find any images above 120px x 120px in a directory where I accidentally dumped some images above that size. There are hundreds of images at the correct size and maybe something like 100 or a few more of an incorrect size. In the Files Util dialog I see an item to find images of a specific size, but not something more versatile that can search for sizes above or below a certain size. Apparently is is not possible in FPV to see lots of images at once... or a thumbnails view. At least I haven't seen how to view anything but one image at a time. So how can I tell FPV to find and process all images above 120x120 so that they are reduced to 120 x 120. If the processing is not possible then at least how to quickly find the oversize images. This will do exactly what you describe, if JPEG output without metadata is what you need (this is what the Save for Web action currently produces). 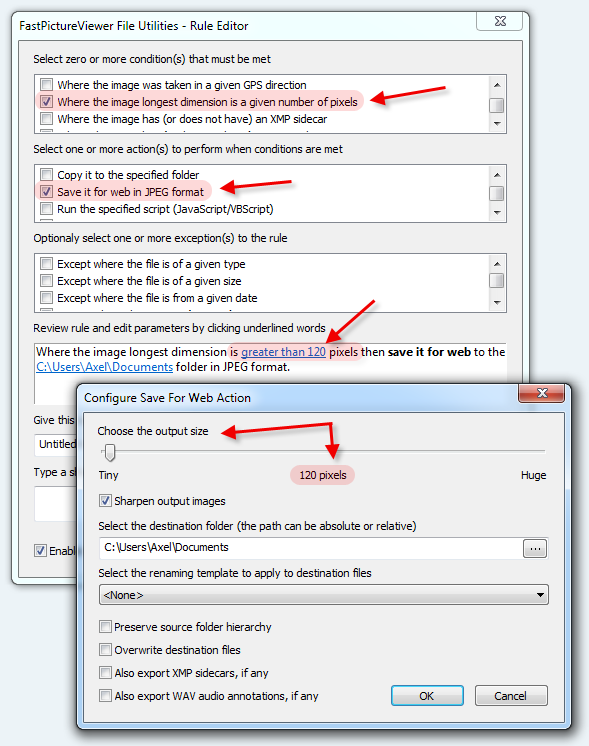 The Save for Web action produces very good quality output ready for web upload or emailing, with a great file size vs. image quality balance. You can optionally apply a tad bit of sharpening to the files produced by this action, if you check the appropriate option as illustrated above. Alternatively, you could use a Copy action instead of Save for Web, and use some external batch image processing tool to perform the resizing if you need output in other format(s), or with the original metadata. In both cases the image dimension criteria ( > 120 px ) will be the same. Finally, the Rule Editor window can be resized and clicking on the scrollbar's up /down arrows (or using the up/down arrows on the keyboard) will scroll the lists exactly one line at a time. I recommend that you go through the File Utilities tutorial on the help page, as well as spend some time looking at the available selection criteria (there are 22 of them...) and the available actions, you should be able to setup rules doing pretty much anything you want in just a few clicks. If a selection criteria is missing (say you want to select images based on f-stop, lens focal length or something else from the available EXIF data) then you can always write a small script that tests for this condition programmatically. This is not as hard as it might sound, actually the Script condition makes it pretty easy: there is a short sample illustrating this type of selection criteria on the tutorial.